Do you ever wonder where the magic of New Zealand originates from? Or why so many people have a soft spot in their heart for a country, a place, a people they have never met or traveled to? I think these images from Whale Watch in Kaikoura New Zealand provide a few clues. Yes, Lord of the Rings is a masterful example of digital special effects. These photos are what you see, feel and experience when you wake up in the morning. No retouching neccessary. Look closely, that could be you standing on the deck feeling the spray from the passing whale and later enjoying a glass of special New Zealand wine for lunch. Whale Watch is New Zealand’s only marine-based whale watching company offering visitors an exciting up-close encounter with the Giant Sperm Whale at all times of the year. Whale Watch scheduled tours operate daily. Our 95% success rate means we guarantee an 80% refund if your tour does not see a whale. Whale Watch tours are extremely popular so we advise to book early. Meet Marguerite and learn a little about the special wines that are created by her and Jean Charles at their vineyard in Marlborough New Zealand. The vineyard is located on a river terrace above the Awatere River. Both Marguerite and Jean Charles agree that wines that are special and bring lasting memories begin in the vineyard. Today Marguerite talks about both Sauvignon Blanc and Pinot Noir. 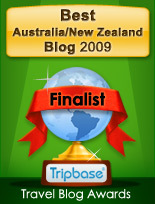 Popular Australian TV travel show Getaway has named New Zealand “Country of the Year” for 2008. Click here to see for yourself. Yesterday I shared part one of an article published by Peter Klann from Little Raven Vineyards in Denver. Part two is below. Peter’s contact details are at the end. I think you will enjoy Peter’s thoughtful comments. The problem with wine rating systems is that the score of the wine depends on the person doing the rating. While Mr. Parker is indeed consistent in his ratings, others may not be. Then add in the fact that so many people are giving scores; it is often difficult to know who gave the rating. Michael De Loach, Vice President of Hook and Ladder Winery in Sonoma County, wonders if scoring mania is healthy for the industry. He says, “If Parker or Spectator don’t give you a high enough score, you can make up your own.” So what really does the “Number” mean? What if wine was judged by its human and geographical context? Can a “Number” capture the relationship between a place and the people who live and grow the grapes? What if wine were rated by how it tasted when it is swallowed rather than spit into a bucket? What if wine was evaluated by how it paired with food? Can a “Number” account for the intersection of aroma, memory and pleasure that gives wine its enduring appeal? What if ratings were given to small, artisan producers and not just large “corporate” producers? You won’t find a lot of numbers and scores at Little Raven Vineyards. Scores are fine for some things, but we don’t think you can “count” taste. We choose our wines the time-honored way – we taste them ourselves. We understand the best wines express a place, a person and a point in the historical continuum. We know that individuals have a wide variety of preferences when it comes to style and stock our store accordingly. We seek out small producers and unusual grapes. And most importantly, we look for wines that are made with honesty and passion, so that we can offer our customers the same wines that we’d be pleased to put on our tables. Heres an exciting find for fans of Pinot noir! New Zealands southerly Central Otago region has rapidly developed a reputation for expressing a special “terroir”, one that is unique throughout the world. Though this region shares a similar latitude with Burgundy, Central Otagos warmer, drier climate allows this persnickety grape to ripen more fully. The resulting wines exhibit distinctively deep, fruity attributes that are much-loved by Pinot noir enthusiasts. Delicious venison from New Zealand is called Cervena. Here is a little of the story. Peter Klann at Little Raven Vineyards in Denver recently published some history and comments on the role of wine ratings. The paragraphs below are his. Part two will be republished tomorrow. His contact details are at the end of the commentary. In 1978, Robert Parker Jr., lawyer turned self-employed wine critic, introduced the 100 point scoring system to the wine world. Consumers intuitively understood this system with 96 to 100 being an extraordinary wine, 90 to 95 an excellent wine, and 80 to 89 is above average to good. Mr. Parker fashioned himself as a crusading consumer advocate on a mission to enlighten the discriminating wine buyer. The method for determining “The Number” is to taste batches to wine together with each bottle covered in individual paper bags. Each wine is swirled, sniffed, and spat into a bucket, and notes are taken on the aromas and flavors. After tasting several wines against each other, a score is attached to each wine according to the taster’s judgment. As Mr. Parker’s influence grew, retailers started quoting Parker points in advertisements and other promotional materials. “The Number” became an excellent way for marketers to promote wine. And soon its effects were felt throughout the industry. “The Number” helped elevate the overall quality of wine, contributed to the growth of the wine market in the U.S., and perhaps even influenced the popularity of certain grapes. But its most direct impact may be in the way wine is sold. So whenever a good number is available (and a good number is anything 90 or above), the wine is heavily promoted through distributors, retailers, magazines, on web sites, and in “shelf talkers.” The wine flies off the shelf based on the taste of one individual determining a rating. Does this person have the same tastes as you? A rating system that draws a distinction between a Cabernet scoring 90 and one receiving an 89 implies a precision of the senses that even many wine critics agree that human beings do not possess. Ratings are quick judgments that a single individual renders early in the life of a bottle of wine that, once expressed numerically, magically transform the nebulous and subjective into the authoritative and objective. Mr. Parker tends to favor the very big, alcoholic and fruit-forward wines; he rates this style in the 90 to 100 point range. The wines he dismisses in the 80-point range tend to be the kind of more subtle and often elegant wines. If you like big and fruit-forward style of wine, you will most likely agree with most of Mr. Parker’s ratings (He is very consistent.) Others have jumped on the numbers game and there are many others rating wines too such as The Wine Spectator, The Wine Enthusiast, and Wine & Spirits Magazine. These publications also use a 100-point scale. But is a review from Robert Parker more or less valid than a Wine Spectator score? Some wine shops require distributors to submit scores when they offer wines for placement, but how valid are these scores? Does any number or piece of press constitute a valid measure? Is the wine critic for Sacramento Bee a solid source, or the Albuquerque Journal? Do they know what you appreciate about the wines you drink? The bottom line is wine preference is highly individualistic; so unless your tastes are the same as the reviewer, disappointment is sure to follow. If you are interested in buying wine based on numbers, it’s always a good idea to go back and read the notes to see who produced the score. The important point is to find someone whose taste in wines runs parallel to your own and see what they thought about that wine you’d like to try or buy. Stay tuned . . . more to come next week.